Although I so rarely find myself buying decor items anymore, I do come across an occasional piece that I know I have to have. A piece I know I will regret not owning when Joe and I move into our house. This was one of those pieces. 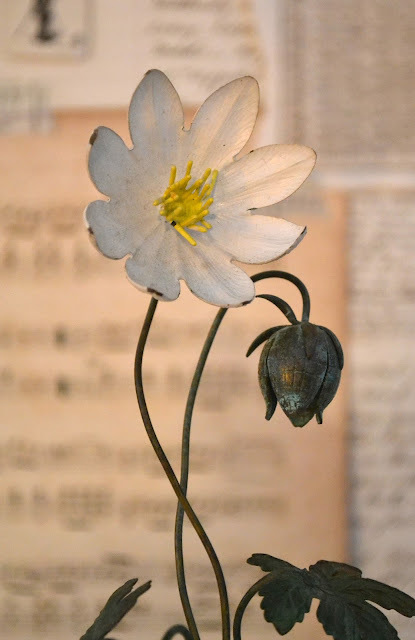 I walked past this metal flower sculpture in a showcase at a local antique mall and it was love at first sight. Standing about about 8 inches tall, I love the nest of roots at the bottom, the details of each leaf, the creamy white paint of the flower itself, and the bud that dangles to one side. After falling in love with the piece I was relieved to see the $18 price tag and knew that it was meant to come home with me! 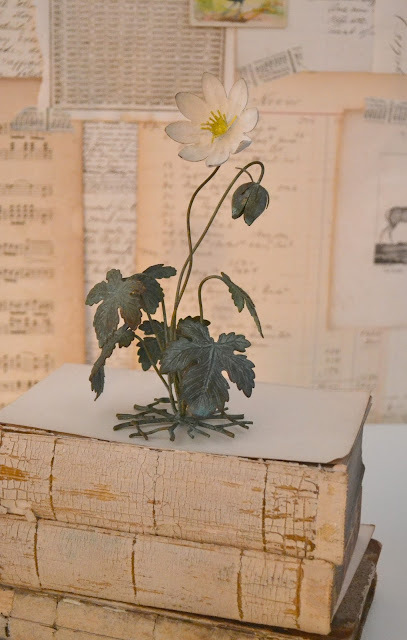 From the moment I saw the flower I felt that it belonged under a glass cloche to create the perfect "specimen" look that is so popular right now! These last few weeks have been a complete whirlwind that have gone by in the blink of an eye. And the funny thing is; most of the people I've talked to lately are saying the same thing. Maybe it's a strange coincidence, or maybe it's because summer is nearing the end (more likely), but whatever the reason- life just feels chaotic. I got back from NYC late last week, and just as I suspected it was mostly work, work, work. I did venture up to time square one night but other then eating at a handful of amazing restaurants most of time time was spent in our lovely Lotus Jewelry Studio booth or inside my awesome Yotel hotel room. Luckily, this show was a smashing success and that gave us the extra boost of energy we needed to work the late show hours and talk to all of our customers. Mom moved into her new, beautiful home while I was away and I finally got to see it on Friday night. It is a victorian style home and has so much charm! High ceilings, huge mantles, and a magnolia tree in the back yard... I can't wait to see the place when she's completely settled in and hope there are some shopping trips in our future! So far, it's looking fabulous! I spent some time today making a back drop for photography at my bench. I feel like space is very limited now, and while we live here I'm not able to make some of the adaptations I'd like to the walls- so I had to get creative and finally found a use for all of the ephemera I've been hoarding for years. I simply started layering and kept going until I like the result! You can see it in the back drop of this photograph... more on this project later! Hope you guys have a great week! Maybe it won't go by in a flash we'll get to relax a bit... maybe! Catching up and I'm off! I've just finished packing my bags for a work trip to NYC. I leave tomorrow very early and I'll be in the big apple all week. These trips to NYC are fairly routine for me now as I go twice a year for the same market show. What makes the summer trips better than winter time is that it's still light out when we leave the convention center at 7pm. It helps me get my second wind and ups the chance that I'll see something other than the Javits Center, my hotel room, and take out restaurants. We'll see, but no promises! I've been wedding crafting as much as possible and having a great time doing it! I plan on doing a video tutorial of my latest project and you can look for that next weekend. I've been inspired to do a vlog post since I started watch my youtube video gurus, and now is a great time since I've been DIYing so much for the wedding. Hopefully people want to see it! My mom is moving into her new house while I'm gone and I can't wait to see it! I feel horrible that I wont be home to help her move but I am looking forward to the "unveiling" next weekend. I know she will do a fabulous job decorating and her excitement is contagious and so well deserved! Joe and I have also come up with some moving plans of our own. We have decided that we'll start looking at places for a mid-November/December 1st move in. Yes, it is a mere week away from our wedding date, and yes, things will already be "stressful enough", but it's time. It does mean sacrificing some things we have been really enjoying since living with the inlaws, but that gets outweighed by the happiness of living independently. I know I'd like to start my married life off on the right, independent foot, and thats ultimately how we arrived at that decision. I hope you all have a great weekend, and check me out on instagram to see photos from my trip! I spent part of the weekend at Mares house relaxing, escaping, and catching up with her. Life is about to get incredibly hectic and I wanted to make sure we got some QT in before my "month of insanity" starts. Her house is so tranquil, peaceful and calming that getting to spend any time there is truly like an escape from every day life and stress. It's perfection! It features a DIY mercury glass vase (which doesn't show well), fresh evergreens and a variety of hand made flowers. On a whim we decided to add a few silver/pewter glass ornaments to the arrangement, and I love the the way they look. Not too kitschy- but just right! We will most definitely be adding those to the arrangements! I have many more photos of the two different arrangements we made, but I'd like to share them with you later, when I'm focusing on all of the floral wedding details. As I said, we also tackled the wedding favors. 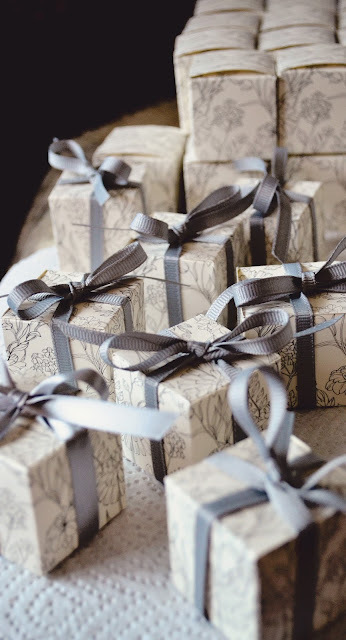 I must admit- I wasn't even planing on having wedding favors, and here's why; 1. even the "cheapest" favors add up quickly when your buying for 150 people. 2. I don't want to give cheap wedding favors. 3. Do people really remember what favors they got at each wedding they have attended, or are favors one of the judging factors of a wedding? No. Anyway, all that went out the window when we realized our decor could do double duty as wedding favors too! Any budget conscious bride will appreciate how wonderful it feels to stay on budget, get the decor look your dreaming up, and send their guest home with a little "thank you"! Then, it felt like the stars aligned when I realized that months ago my mom had purchased 150 of these so-cute favor boxes for the wedding when we found them on sale at TJ Maxx. (is it obvious yet how much I love a good deal?) And while they they are too small for the votives, they do fit 3 small tea light refills perfectly! Done and done. We picked up those bulk tea light bags at Hobby Lobby and got to work filling 150 boxes. Then we focused on embellishing the boxes to fit with our wedding theme. Each guest will have this sweet little box waiting at their seat which holds three tea lights and a note that thanks them for coming and asks them to please take a glass votive from the table at the end of the night. Each of the boxes will be embellished with silver satin ribbon and sprigs of natural boxwood that has been jazzed up with splashes of german glass glitter. In the end I still know a favor is just a favor, and many of these may end up in the trash. Mercury glass isn't everyones look and I understand that. Most importantly I think these favors truly represent our wedding and the aesthetic guests will find at our wedding. We put a lot of love and attention into each of these little favors and I know that will be noted and appreciated. 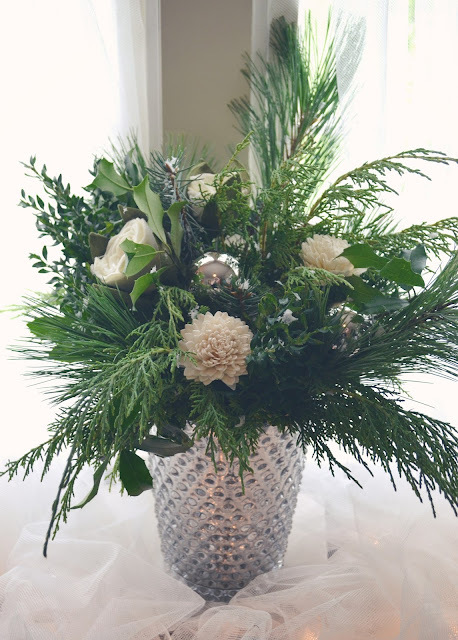 I'm thrilled that while I may not have a lot of money in the "favor" budget, I've certainly got time and love to give and I think these favors highlight that! 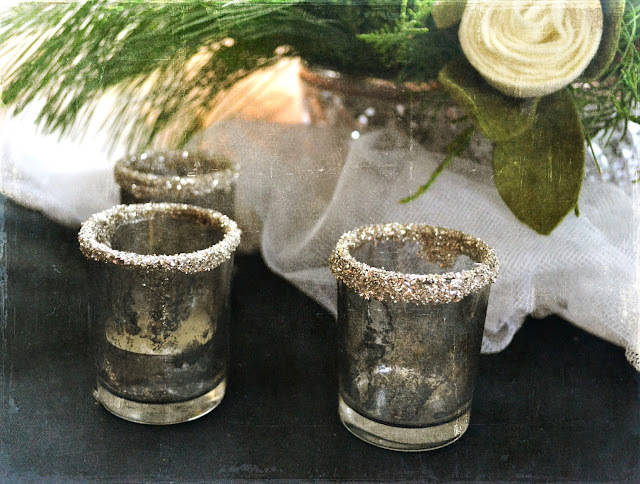 With the wedding quickly approaching we decided it was time to test out the DIY mercury glass techniques we'd seen on pinterest. 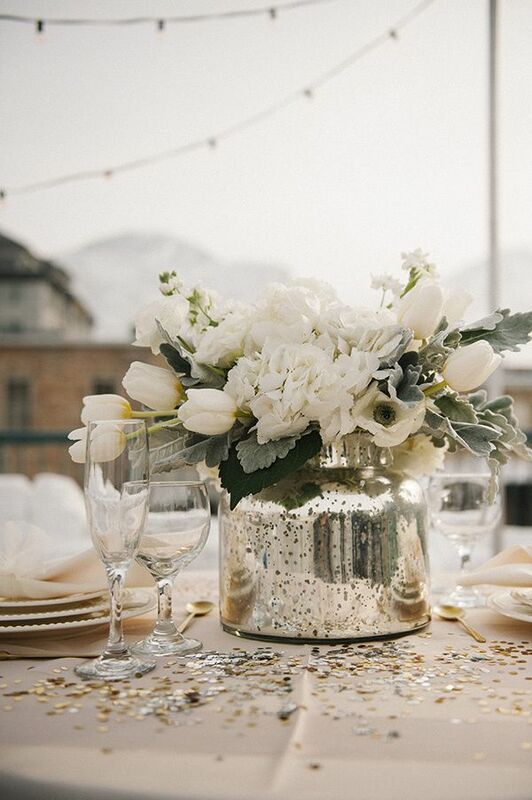 The mercury glass vase centerpieces and vases are a huge aspect of the romantic, vintage vibe I'm going for with the wedding and I figured it was better to find out sooner than later if I needed to rethink things. We were ready with the twenty-something glass vessels Joe and I had yard saled, plus another dozen mom and I had picked up at flea markets. (btw- flea markets are a perfect place to find them- again we never paid more that $2) as well as all the supplies they listed in the multiple tutorials I read. And while I was worrying about doing it "just right" when I got started, I quickly learned that it's nearly impossible to mess the process up, and the results we go were phenomenal. Like "I can't believe we pay so much for mercury glass in the store" incredible! As you can see, we were able to get some very unusually shaped glassware which added so much interest to each pieces. I love that they don't look "cookie cutter" and truly do look old and vintage. Each vase can be done in less than 10 minutes and they really do look amazing. Applying the finish and perfecting each one was almost magical and I was so sad to get to the end of my glass pile. 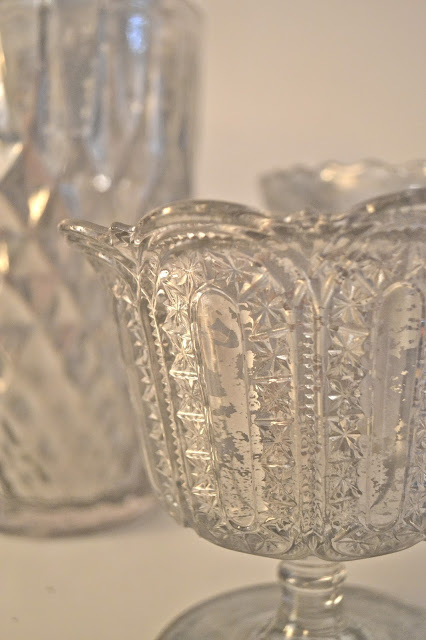 You can find countless tutorials for DIYing your own glass on pinterest, many with subtle differences in steps but all achieving the same beautiful results. My suggestions are this: don't stress when getting started! All you need to know is the vinegar is the resist. It either inhibits the paint from sticking wherever it was sprayed, or it can be used on a paper towel to rub the paint off of areas that were over-sprayed. Anything goes! Other than that you just need to make sure you are using white vinegar. We tried apple cider vinegar first and it does't work at all! We also sprayed a handful of vases with a thing layer of matte black spray paint on the interior after the distressing was complete. It gave the pieces much more depth and an older appearance. I suggest trying this out in light layers on once piece only before you go crazy. It's a different look, and you may not prefer it. don't forget to do the base! I encourage you to give this DIY project a try. 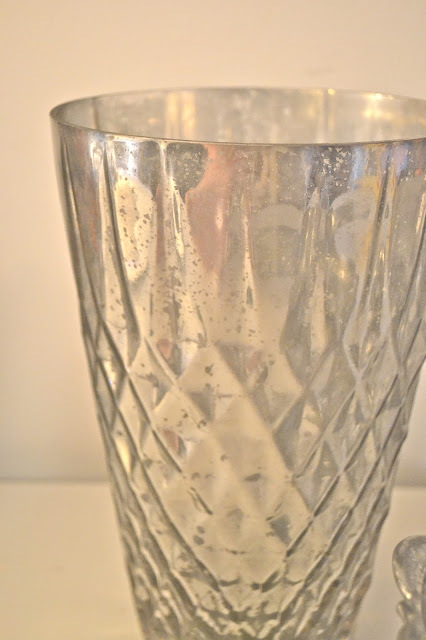 I promise you will be amazed, and hopefully have a great time hunting for vintage glass pieces. If flea markets and yard sales aren't your thing then consider hitting up the dollar tree or similar discount stores.